The goal of yoga is yoga itself. Union itself of the little self and the Real Self. A process of awakening to the pre-existing union that is called Yoga. It has to do with the realization, through direct experience, of the center of consciousness or Real Self. Yoga views the human being as manifesting outward step by step (from the subtle body/Real Self to the gross body/outer world) where the subtler consciousness projects evermore outward and then gradually forgets those subtler levels. In Aquanimous Yoga, we will move inward from the gross body to the subtle body wherein each aspect of the self is trained independently while also being trained to flow together. Our systematic process deal one by one with our actions in the world, senses, body, breath and both the conscious and unconscious aspects of mind towards union or realization. Integrating all of this with the systems and philosophy of Ashtanga Yoga and Vipassana Meditation, our classes are designed to help you systematically investigate each aspect with some depth so it has a chance to take root in your body and nervous system thus becoming an integrated part of who you are. Over the course of our program, you will also build an embodied understanding of awareness and equanimity (both external and internal), as well as loving kindness and compassion so you may engender an enduring state of equipoise in all levels of your being. Ashtanga Yoga and Vipassana Meditation are the pillars of Aquanimous Yoga. They are the two most time-tested ancient techniques for keeping the body, mind and spirit in harmony and in sync. There is no contradiction between the two. They are complementary to each other. Yoga asanas were developed for preparing the body and mind for the purpose of sitting in long meditation and as a preparation for receiving higher wisdom. The sequence of Ashtanga Yoga and its techniques like ujjayi breathing, bandha, dristi and subtle body awareness are necessary to purify the body and the nervous system. Its whole process was designed to eliminate the pervasive impurities in body and mind. Vipassana Meditation technique is a tool for mental purification. It is done through experiential and non-judgmental self-observation. Through experiential understanding of the impermanence, non-self and dissatisfaction in all phenomena, deeper insights and wisdom develops leading to eradication of the seeds of suffering. Observation of the moment-to-moment experience cleanses the mental layers, one after another and gradually, higher wisdom appears. In our modern times, I have found that most yoga practitioners get trapped in the superficial, external objects such as achieving the “perfect pose” rather than moving deeper into meditation. Even the techniques of concentration practices do not lead to complete mental purification and the practice often do not succeed in the development of deeper wisdom and insight about reality, which is necessary for permanent happiness. This is where Vipassana Meditation helps. On the other hand, due to its defect in implementation, many Vipassana practitioners suffer from a variety of mental and physical problems. Particularly, these type of problems arise in long Vipassana meditation courses. Deep seated fears, anxiety, anger and other emotions come to the surface of the mind and the practitioner is unable to maintain equanimity when such patterns of thought or mental visions come up. However, just by practicing a few energy balancing and dynamic yoga asanas, these imbalances are often cured and people return to their normal healthy life. Only when our body and mind are prepared, we can derive the benefits of Vipassana. Yoga prepares the body and mind for receiving the higher wisdom and understanding that Vipassana Meditation brings up. When we practice them together, we get the maximum benefit from both. From Asana to Samadhi. Yoga asanas prepare the mind and body for meditation. In the same way, you will find, as you improve in your meditation practice your asana practice deepens as well because your concentration becomes sharper; you begin to discover the inner dimensions of your life. This self-discovery, practiced with self-acceptance, compassion and equanimity, allows you to change destructive habit patterns and therefore your life and relationships. This is the essence of spiritual practice. In my yoga journey as a student and teacher, I have experienced some forms of difficulty in these two traditional systems (physically or otherwise) that either needs to be encouraged to keep going and focus on the standard technique, or needs to be given an alternative in order to facilitate greater ease of practice. 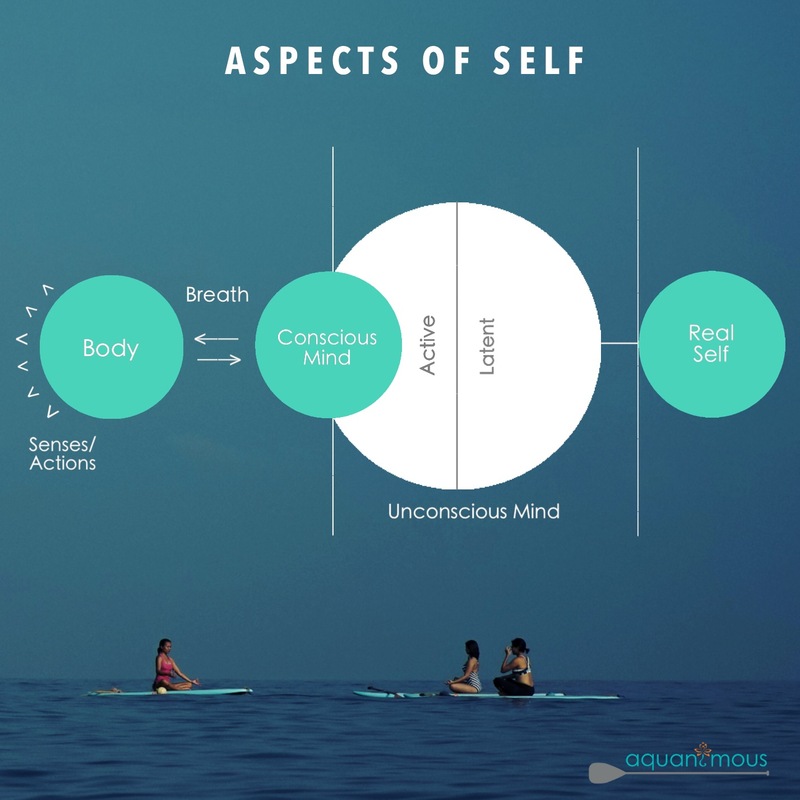 Because of this and with my affinity for water, I have created several classes for Aquanimous Yoga that uses the Balance Board and Stand Up Paddleboard to support and offer a physically and psychologically holistic and progressive approach towards the practice of Ashtanga Yoga and Vipassana Meditation. Each of these classes work together in targeting the different aspects of the mind and body, giving the student a systematic and holistic path for growth and well-being. Dividing up the practice in this way is, of course, somewhat artificial. Practice is an ever-deepening and never-ending spiral. In reality, all of the aspects of the practice intermingle to form one organic whole. But by inviting a particular dimension of our experience into the foreground for a while can help us cultivate a new kind of intimacy with it, like having a deep conversation with a single person in the midst of a crowded party. And as you progress in the practice (to strain the metaphor a bit) you’ll be able to dance with everyone there. “Sila”, “Samadhi” and “Panna” are the three pillars of Vipassana Meditation. Almost the same things are known as “Yama”, “Niyama” and “Samadhi” in Patanjali’s yoga. The meaning of these three are self-discipline, concentration and wisdom. The last two features are developed by meditation practices. However, these in turn depends on the foundation of self-discipline. In yoga “Yama” and “Niyama” are the two cornerstones on which the entire gamut of yoga practice depends. If we do not have some degree of self-control in our actions and deeds, the mind cannot concentrate and meditate effectively. However, by practicing some regulations on our behavior, meditation practice will move forward effortlessly. Respect, responsibility, kindness, honesty and trust towards higher values are foundations of character. Character gives integrity. Integrity gives internal consistency. It gives stability of mind. It frees the mind from inner conflicts. When our mind is free from inner conflicts we can achieve the highest.